If you are looking to buy meat online, then we have a wide range of our Great Taste Award Winning meat products. Our butchers freshly prepare the meat, only using premium produce, we don’t freeze, use salt preservatives so that you know you are getting top quality. Try our fresh meat delivery service as we deliver to a location that is convenient for you. 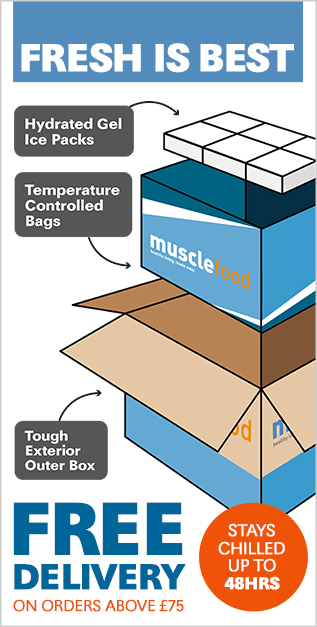 Always enjoy a super fresh meat delivery with Muscle Food. This service is available on a huge range of products including a selection of fresh meats, 5kg chicken breasts, liquid egg whites, all exotic meats and seafood plus supplements and many more items. If your basket ONLY includes items which are labelled as next day delivery and you order before 7pm we will send your order out on the same day, for delivery the very next day! Or you can choose any future delivery date that you would like. Please be aware: Next day delivery orders can’t be edited after you complete your order. If you have any items in your basket which are not available for next day delivery, to reduce your delivery costs we will automatically provide the next available date for ALL your order to be delivered together. ORDER BY 12PM FOR NEXT DAY DELIVERY ON FRESH MEATS TOO! Some items take a little longer for our Great Taste Award Winning butchers to freshly prepare. If your basket contains items which are not available for next day delivery, the following order schedule will apply, or you can choose any future delivery date that is convenient for you. And remember, if you are not going to be in to receive the delivery just add a note when you place your order and our couriers will leave it in a safe place for you. You can edit your future order at any point up until the above deadlines. For example, if you order on a Monday for a Friday delivery, you can add new items your order up until Wednesday at 7am. The Delivery date may change if items are added due to delivery availability, once this is changed it can't be changed back. Once your order has been processed you will receive an e-mail with the details of your courier and full tracking details, courtesy of Yodel. With Yodel, you can choose any day of the week for delivery, receive an SMS telling you the specific two-hour slot your order will be delivered and even track it on Google Maps! We are excited to announce that we can now offer you a two-hour delivery window! When your goodies are out for delivery, our courier will send you a quick SMS to let you know the specific two-hour slot your parcel will arrive. Pretty niffty! Please ensure that you double check your mobile phone number when placing your order. Also be aware that this is an estimate and drivers can be delayed due to factors outside of their control such as heavy traffic and road closures. All deliveries can be left in a designated safe place or with a neighbour but if you wish to sign for your delivery yourself our SMS notifications will help! On the day of delivery your chosen courier will inform you when your order is on the van for delivery. An SMS will be sent by the courier within a specific two-hour slot. A further notification is sent from Muscle Food within 15 minutes of your order being delivered. This is activated by our GPS which tells us when an order is close to your address. All our meat is delivered in specially designed temperature controlled boxes that stay chilled for up to 48 hours, guaranteeing you fresh produce every time. Top quality temperature controlled boxes - Our insulated boxes are made from closed cell non cross linked polythylene keeping your meats fresh for up to 48 hours. Hydrated gel ice sheets - These specially designed sheets are pre-cooled before enveloping your order to ensure your meat arrives chilled (not frozen). They help keep your meat as fresh as the day it was cut and they can be reused. 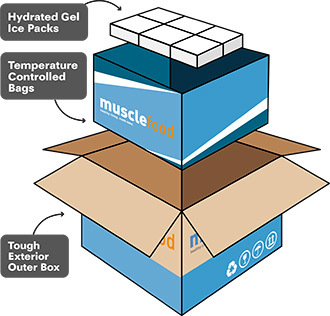 Triple strength layered box - Our custom made boxes are three times stronger than ordinary boxes and are specifically designed for carrying chilled meats. Delivery within 24 hours - Although the boxes are designed to stay cool for 48 hours, we aim to deliver your meat in 24. If you live pretty much anywhere in the UK – we will deliver to you. Hurrah! Your scheduled delivery will usually arrive 24 hours after being picked and packed. If you live in one of these Extended Delivery areas, we recommend you choose delivery dates that fall only between a Tuesday and Thursday. For all IM and BT postcodes, the earliest delivery date you can choose will be Tuesday for delivery on Wednesday and the latest is Thursday for delivery on Friday. These are subject to change of course. Weekend Delivery services are available to all Next Day areas excluding Northern Ireland & Isle of Man.